Punctuation is a device by which we aid words to tell their story. Words have done this at times without such aid, and may now do so, but at constant risk of serious misunderstanding. This can be easily seen by reading the following lines printed as they would have been written in an ancient manuscript. Probably this particular passage could be read without danger of serious misunderstanding. The two well-known passages which follow, however, are cases where either a simple statement may become a ridiculous travesty or a serious arraignment may become a eulogy by punctuation. Lord Palmerston then entered on his head a white hat upon his feet large but well polished boots upon his brow a dark cloud in his hand a faithful walking stick in his eye a menacing glare saying nothing. He is an old man and experienced in vice and wickedness he is never found in opposing the works of iniquity he takes delight in the downfall of his neighbors he never rejoices in the prosperity of his fellow-creatures he is always ready to assist in destroying the peace of society he takes no pleasure in serving the Lord he is uncommonly diligent in sowing discord among his friends and acquaintances he takes no pride in laboring to promote the cause of Christianity he has not been negligent in endeavoring to stigmatize all public teachers he makes no effort to subdue his evil passions he strives hard to build up satans kingdom he lends no aid to the support of the gospel among the heathen he contributes largely to the devil he will never go to heaven he must go where he will receive the just recompense of reward. 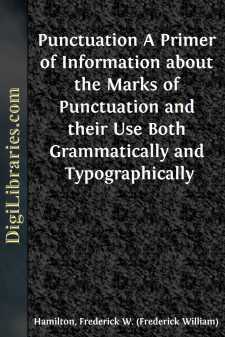 Punctuation being intended for the sole purpose of making the text intelligible and removing as many of the causes of possible misunderstanding as may be, must depend in the last resort on a correct understanding of the text. This understanding may be obtained from the text itself, from the context, that is, the writing as a whole, or from outside knowledge about the matter under consideration. The prisoner said the witness was a sneak thief. The prisoner, said the witness, was a sneak thief. The meaning of this sentence depends entirely on the presence or absence of the two commas. Manuscript comes in to the printer hastily written by the customer, author, or a reporter, or ticked over the telegraph wire, and there is little or no punctuation. Probably the context will supply the needed information and the line may be set up correctly. If there is no way of finding out what the sentence means, follow copy. Insert no punctuation marks which you are not sure are needed. Punctuation as we know it is of recent invention. The practice of the art of printing brought the necessity for a defined and systematized use of the points which had, most of them, long been in existence, but which had been used largely according to the personal preferences of the scribes or copyists. With the coming of the new methods of book reproduction came the recognized need for standardization and systematization. The most ancient inscriptions and manuscripts are merely strings of letters, without spacing between words or sentences and without any points of any sort, like the example on page 1.